Those chess pieces are designed in giant size. You should consider and prepare about the area to placed those chess set. Furthermore, you can use it for chess game indoor and outdoor, as long you have the wide enough area for those giant chess size. Consider to put it at your garden, backyard, beach, camp area and so on. Although those pieces are in giant size, but they are easy to move by dragged it. Not only adult people like to play chess. Children and adolescents especially love these pieces, and they are still not too large, nor too heavy, to be taken with you wherever you should wish to play. 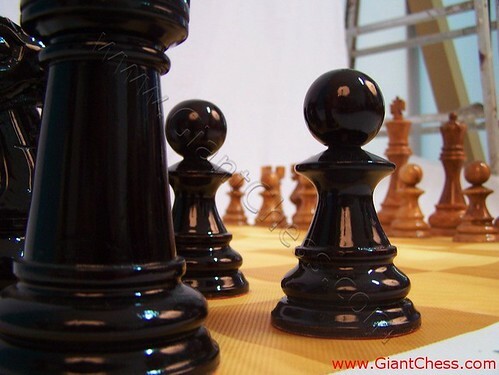 Those chess pieces are made from best Teak wood and carved by good craftsman. Even if kept permanently outdoors, in yard or garden, because they are of teak they can withstand any weather. Very durable for outdoor game, make this kind of chess usefull for any ages.